Are you likely, sometime in your lifetime, to have to leave your home quickly or be on your own in an emergency? The answer to that question is yes. A survey conducted by the Hazards and Vulnerability Research Institute at the University of South Carolina for Time magazine found that 91% of Americans live in moderate-to-high risk areas for natural disasters or terrorism. Have you thought through how you will save the lives of both your human AND animal family members? RESCUED: Saving Animals from Disaster (New World Library) is the culmination of hundreds of interviews we did with the survivors, volunteers, and leaders of animal organizations that came together in the largest animal rescue operation in history after Hurricane Katrina. We asked them to tell readers how to save animals from disaster. Their experiences will inspire you. They will make you think. They will bring tears to your eyes and smiles to your face. They will catapult you into action. This book shows your fellow human beings at their best and highest, giving of themselves without expecting a return. RESCUED includes 16 pages of uplifting action photos that show animal shelters, sanctuaries, volunteers, and charities doing good work -- all the time, everywhere..
We concluded that animal rescue is becoming an important social movement in the United States and the world because of the prevalence of household pets in two out of three homes and the number of people with service animals. With 7,000 animal organizations and 10 million members, animal rescue has woven itself into the fabric of American life. Whether you have a pet or not, the animal rescue movement affects what you eat, what you wear, the movies you see, and the laws that govern your actions. What would you do if there were a house fire, a chemical spill in your neighborhood, flash floods, wildfires, mudslides, an earthquake, hurricane, tornado, or terrorism threat that called for fast evacuation? This book will help you make life-saving emergency plans and be realistic about how to implement them. Could you and your pets survive, isolated without emergency help, for as much as 72 hours? That's what the CDC says you might need to do in the event of a disaster. This book helps you think through basic survival needs. What if you are intrigued by animal rescue, whether as a volunteer in disasters or as a means of saving your own beloved pets? This book gives you quality information for how to be trained or even to choose a career in animal rescue. What did the media NOT report about animal rescue? Although the media played a major role in inspiring volunteers to rescue animals, our in-depth interviews yielded amazing details and twists that were left out of news stories. Such as, what happened to Dr. James Riopelle after his rescue by Matthew McConaughey was televised on the Oprah Winfrey show, broadcast from New Orleans? Which celebrities support animal rescue and why? We were able to pose questions to celebrities, some of whom are not well known for their devotion to animals. They wanted to talk about animal rescue for this book because they think it is so important to support. RESCUED contains many stories of rescues with happy endings -- either by animals and people being reunited or animals finding wonderful new homes. On the cover of our book is a touching image of a rescued golden retriever drinking water poured by a volunteer. It was taken by photographer Troy Snow who works with Best Friends Animal Society. Best Friends set up a temporary shelter in Tylertown, Mississippi. 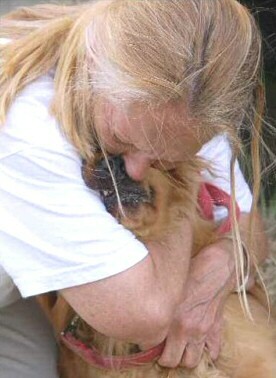 Due to the work of animal rescuers, the dog on our book cover, named Baby, and her human companion, Aggie, were reunited. We hope you will treasure the compassion and wisdom in this book. If you are a volunteer or staff member who rescues animals, consider RESCUED a tribute to your love, courage, and devotion. If you have an animal in your home, read these pages to learn how to protect him or her should there be an emergency. Discover the ways that legislation and preparedness need to function so animals are never left behind in disasters again. If you love animals, let RESCUED inspire you to take the next steps in supporting animal rescue in your community, in the nation, and in the world. by Allen and Linda Anderson. Troy Snow says, "Aggie and Baby were so excited and happy to see each other, that anyone within eye or earshot of what was going on, was completely overwhelmed. I was literally shooting this photo through tears and hoping I got the shot." Click WCCO (CBS) Evening News to watch an interview with Allen and Linda Anderson. Click Living on Earth (NPR) to listen to an interview about Rescued: Saving Animals from Disaster. Click Amazing Angel Animals to watch how authors Allen and Linda Anderson reach out with their amazing message -- animals and people are spiritual partners in this world. Note: DVDs are available with additional television interviews featuring Allen and Linda Anderson upon request by media outlets. Click to purchase RESCUED: Saving Animals from Disaster, Life Changing Stories and Practical Suggestions autographed by Allen and Linda Anderson from the Angel Animals online bookstore. "RESCUED: Saving Animals from Disaster was very well received by the students and my faculty colleagues. It provided a very helpful framework for our [Animals in Disaster, Spring 2007, Arkansas Tech University] course study." "Rescued is the most comprehensive book to date on what became a major news story after the storm – caring for the animals of New Orleans. . .The book is an urgent call to action, and readers who have pets will find it a useful guide to evacuating with animals – for preparedness, as we all learned, is everything." "The most important chapter, to our minds, reviews the lessons learned from Katrina. The first was, 'Hurricane Katrina provided a wake-up call for mainstream Americans to recognize the importance of saving animals from disaster.'. . . . The Andersons list some of the common sense precautions that animal guardians can take to ensure their pets' well-being during disasters." "[RESCUED] is one of the most inspiring accounts in print -- besides offering action and adventure, it offers pet owners important tips on keeping pets safe." "Deeply moving stories and up-to-date information about this very important and often ignored aspect of natural disasters. Highly recommended! Award winner of Animals/Pet category, the Best Books 2006 National Book Awards." "Local authors Linda and Allen Anderson (also writing instructors at the Loft Literary Center in Minneapolis) turned their horror into action, writing the compelling book RESCUED: Saving Animals From Disaster. Through emotionally wrenching, firsthand accounts of animal rescue and reunion, the book examines how the hurricanes of 2005 changed the way Americans view animal rescue." "Believing that domesticated pets are family members and that by helping them one is also helping people, the Andersons detail what has been learned from Katrina and provide instructions for readers in the event that they face an evacuation. The authors stress that owners must take primary responsibility for their pets and that rescue volunteers should be properly trained. . .their advice is well taken." --Publisher’s Weekly review, July 24, 2006. Copyright. All rights reserved. "The volunteers who waded into the devastation left in Hurricane Katrina's wake came in all sizes and shapes and redefined our notion of hero. Many of these unlikely champions scooped endless shovels of poop, distributed truckloads of food and clean water, and provided comfort and kindness to animals whose world had blown apart. They worked against Brobdingnagian odds: hundreds of thousands of frightened, starving animals owners were forced to leave behind and little space in which to care for the abandoned pets. "Allen and Linda Anderson extensively interviewed the men and women who came to rescue four-legged, finned, and feathered victims of Katrina. The result is a treatise full of practical suggestions for dealing with stranded animals, meeting their housing and medical needs, and, ultimately, reuniting them with their owners. Aftermath stories will change public policy, and every pet owner should read the Andersons' book and develop their own private plan for the safety of their nonhuman companions." --Pamela Crossland, Booklist, American Library Association, August 2006, Copyright. All rights reserved. Rescued: Saving Animals from Disaster won the 2007 American Society of Journalists and Authors (ASJA), self-help/service category book award. Compelling, fascinating, and most important -- highly moral. Highly recommended! Award winner of Animals/Pet category, the Best Books 2006 National Book Awards. A must read that I couldn't put down, RESCUED will move you to action. American Humane applauds the Andersons' tireless efforts to pay homage to the hundreds of individuals from scores of animal welfare groups who gave so much to rescue the animal victims of Hurricane Katrina. It is an important work that will warm the hearts of all readers whose animals are an indispensable part of the family. The authors and the publisher are donating a portion of proceeds from this book to animal organizations.